The Build-A-Bear Workshop project was a huge undertaking that would ultimately change the way they interacted with their customers forever. We were tasked with completely revamping their complete experience, and digitally augmenting it. The reasons were two fold - to create a much stronger emotional connection with children, and collect more data to effectively market to the right people going forward. There were 4 main stations we worked on. This station was created to allow the children to imbue a physical heart with digital attributes they wanted their furry friend to hold. The child can input their birthday (which allows for a special "unlock" if the birthday is within 2 weeks of the current date - shown below) and input their name onto what we coined the Keytar (keyboard + guitar). This station allows the child to "wash" their bear, and play around in the tub. Arguably the most data driven application of the three, this was meant to replace an aging system thats existed since Build-A-Bear's inception. The child can choose their bear's name, and input all the pertinent data about where they live and contact info should the bear get lost. We tried very hard to bring a smattering of magic to the experience, but some portions are simply data entry in the end. 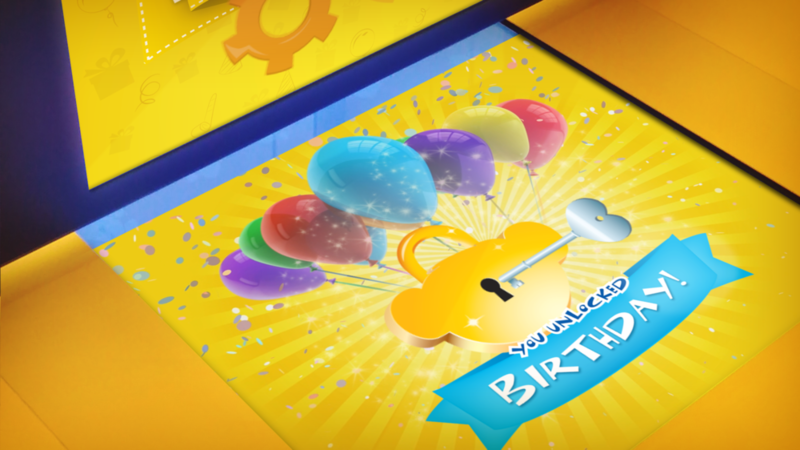 The final piece of the Build-A-Bear experience is tailored "unlocks" for kids based on promotions or special events like birthday's. The intention was that because this is a fully digital platform, we could leverage the malleable nature of it to change all the graphics and theme the whole experience. I'm still trying to source a video, but for the time being I have a couple screenshots of the unlock experience in action.